Going away on vacation doesn’t mean that one should throw all hair responsibilities out the window. You’ve got to take care of your hair whilst away, so that when you get back home your hair is even better than before. I compiled a little list of the hair products that are essential to keep your hair looking, feeling and smelling great whilst away on holiday. I have curly hair, so this spray is definitely one of my favourites. It’s like a hairspray, in the sense that it keeps your curls intact and holds them in place but unlike a hairspray, it doesn’t harden or create white flakes on the hair. On days that I’m not straightening my hair, I apply this spray after I’ve towel dried/blow-dried my hair and it really works well in preserving my natural curl. If you love Argan Oil, then you will love this one! Dove’s Pure Care Dry Oil is formulated with African Macadamia Nut and is extremely nourishing and moisturizing and works wells on all hair types. It absorbs quickly into the hair so it doesn’t leave it oily or greasy. You can apply it on wet or dry hair and it really does help to soften hair and to smooth out and banish any dryness. I apply about 4pumps of this oil on to damp hair and another pump on dry hair before styling. I love that after applying this oil my hair is much softer and smells great too. You can even pop this into your beach bag, so once you step out of the pool/beach, you can apply it to your wet hair to tame any potential frizziness. This Dove shampoo is great for an everyday wash when on holiday. Just like the Dove Oil, it nourishes and adds moisture to the hair. It works especially well on frizzy hair, but you can use it on dry, straight hair too. If you are washing your hair after a swim, I wouldn’t suggest using this shampoo on its own (See 4 below) as it doesn’t do much to cleanse the hair. I usually use this shampoo after using a cleansing shampoo as I find that when doing this, my hair looks and feels much better – I basically use it as a conditioner after a swim. So, I saved the best for last. This is honestly one of the best cleansing shampoos that I’ve used to date, it even beats the Tea Tree Shampoo from The Body Shop. I love using it after a swim in the salty beach or chlorinated pool as it totally cleanses the hair and eliminates any roughness caused by the chlorine/salt. I used it over the weekend, after swimming at the beach, and it promptly removed all of the sand in my hair, after just one wash. Sometimes, your hair can feel a bit squeaky clean and dry after using this shampoo, so I usually follow up with Dove’s Nourishing Oil Care Shampoo just to give my hair a jolt of moisture. So that’s it! 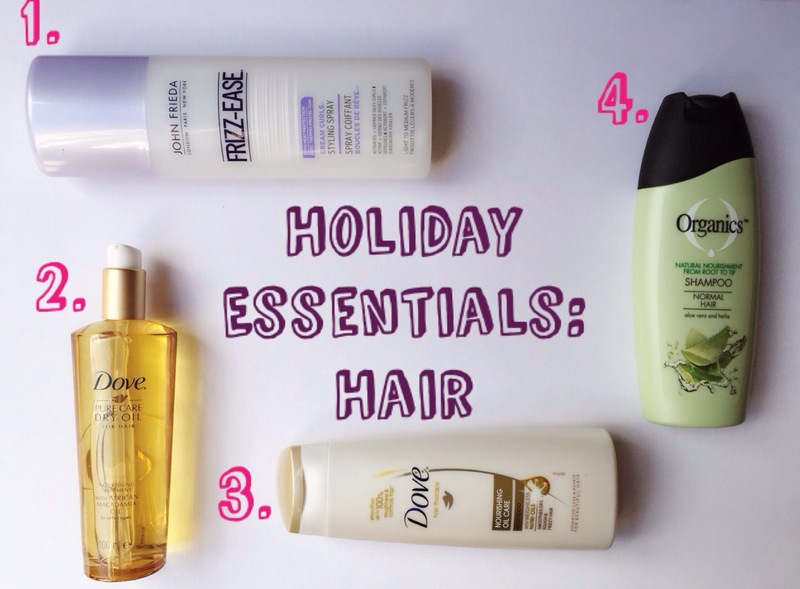 Just 4 products that will ensure that your hair stays healthy and nourished whilst on holiday!